**FREE PREVIEW** Greg Jewett takes a deep dive into the numbers to tell fantasy baseball owners what they can expect from the Red Sox outfielder during the 2019 MLB season. 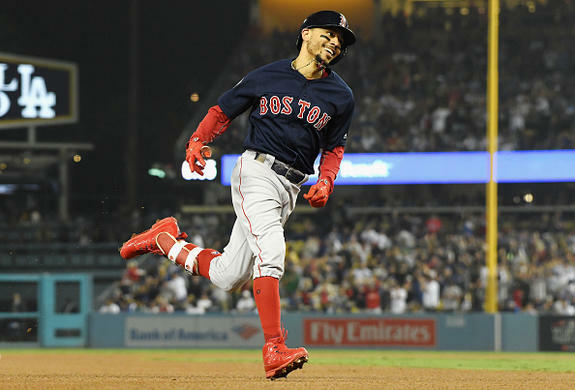 For years, the runner-up pick in snake drafts could cause heated debate, in 2019, fantasy owners will be ecstatic to select Mookie Betts . 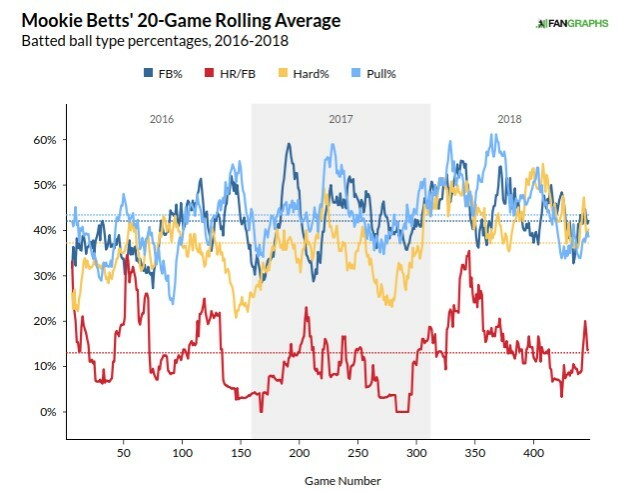 Fresh from a career year in his Age-26 season and on the precipice of his power peak years, Betts could stake his claim as the top rated player at the end of the season, unless of course, Mike Trout also records his best season as well being one year older than Betts. Either way, owning the second pick will be appealing taking whoever the owner with the first pick passes over. It’s been proven that oblique injuries can sap hitters power upon their return and Betts did not finish with the same power he flashed prior to his injury, but showed signs of life after July. Before his injury, Betts averaged a home every 11 at-bats. From June on, it slipped to a home run every 22 at-bats culminating in one every 24 at-bats the last two months of the season. However, before dismissing power upside for 2019, Betts racked up 19 doubles along with his 17 home runs his first 184 at-bats. Over his last 171, Betts recorded 20 doubles and seven home runs. Also, note he did miss some time in September with soreness in his left side, the location of his first injury, on the 16th when facing the Yankees. When checking his overall profile, Betts owns tremendous plate discipline evidenced in his 9.3 walk percentage against his 12.3 strikeout percentage during his last 2,710 plate appearances. Not exactly a small sample size. He’s also recorded at least 40 doubles in each of the last four seasons. Last year represented the lowest chase rate (19.8 percent) of Betts career and his career O-Swing percentage of 22.8 should impress fantasy owners. Plus, Betts Z-Contact (in the strike zone) of 93 percent aligns with his career 93.4 percentage. According to research, 94 percent of home runs occur between a launch angle of 20-to-40 degrees, and the highest amount of them in the 25-to-30 degree range. Betts not only increased his launch angle by over four degrees, but his fly ball and line drive exit velocity rose by three miles-per-hour culminating in a spike of his barrels per plate appearance. 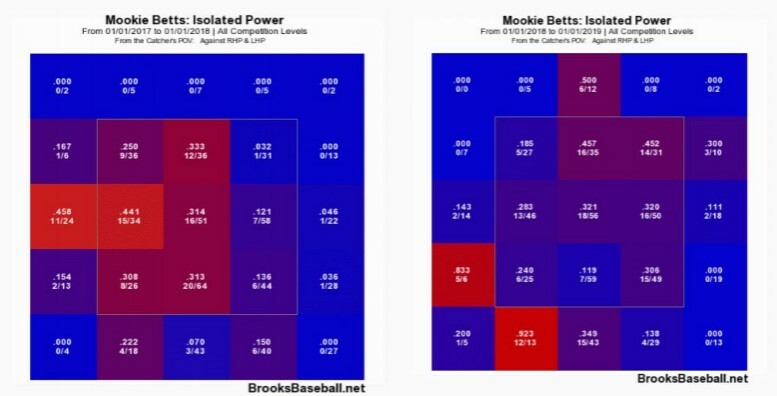 When trying to project how Betts will do in 2019, his power upside exists. Many will focus on the second half numbers without focusing on the overall gains in his underlying statistics. Additionally, if Betts starts to hit the ball with force to the opposite field, a whole new world awaits in his production. Not only did Betts improve upon pitches in the upper outside of the strike zone, he also improved on pitches outside the zone below his power sweet spot from 2017. Which leads to his projections. Steamer Projection: 150 games, 586 at-bats, 115 runs, 29 home runs, 92 RBI, 26 stolen bases, .302/.385/.535 slash. ZiPS Projection: 148 games, 591 at-bats, 114 runs, 28 home runs, 94 RBI, 29 stolen bases, .299/.379/.528 slash. Using his expected statistics, Betts owns a .306 expected average the last three years which matches his actual .306 average in them. Even if the home runs per at-bats ebb back towards his three year rate of one every 21, it’d be silly to dismiss his start to the season. Moving to second in the lineup will affect his counting statistics. Boston’s second hitters last year accrued a cumulative 110 runs and 91 RBI in 669 at-bats with 22 stolen bases. It’s encouraging to think J.D. Martínez does not worry about runners being aggressive in front of him while hitting. 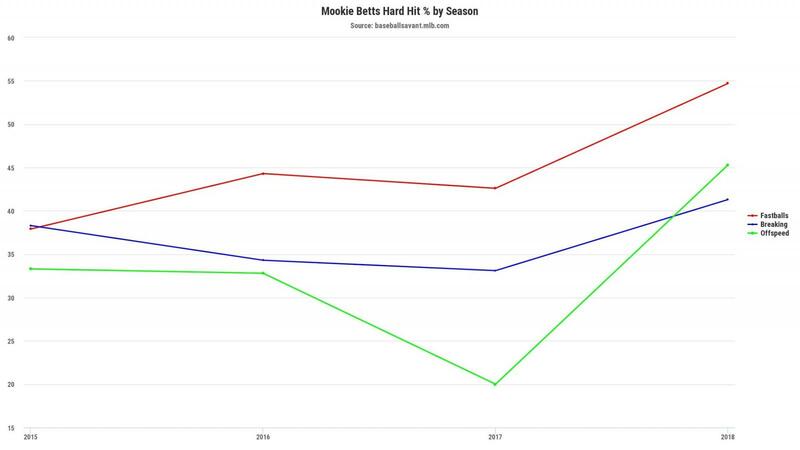 Betts, with health, should see his runs decrease but RBI grow hitting second. This reflects in his projections above. They do not account for the four degree surge in launch angle and hard hit rate spike. What makes getting Mookie Betts second in drafts will be the high floor. There’s safety if he just repeats his last three year averages in terms of production. But, Betts could hit 35 or more home runs, given he does not injure his oblique and stays healthy in the year ahead. A growth stock in fantasy does not usually present itself this early in the draft, but the runner-ups who get Betts this season should be happy he fell to them.